The ~Maestro brings us this medieval vignette depicting feudalism in medieval Europe. For those unaware, feudalism combined customs in both military and legal matters hundreds of years ago between the 9th and 15th centuries. Hey, look at that! 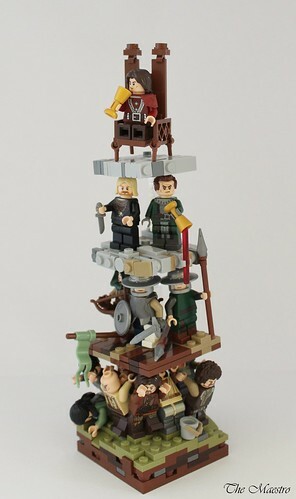 You looked at a cool LEGO creation, and learned a bit of history! That is one thing I appreciate about some LEGO creations that depict historical events: you learn more in a fun way! I think I'll wrap up this post, though, because those guys on the bottom are no doubt getting rather tired (not that the lord cares).